Tami Simon: You’re listening to Insights at the Edge. Today my guest is Jeff Foster. Jeff teaches and shares from his own awakened experience a way out of seeking fulfillment in the future and into the acceptance of “all this, here and now.” Jeff’s teaching style is direct and uncompromising, and yet full of humanity, humor, and compassion. He belongs to no tradition or lineage and makes his teaching accessible to all. In 2012, Jeff was voted by The Watkins Review to be one of world’s 100 most spiritually influential living people. 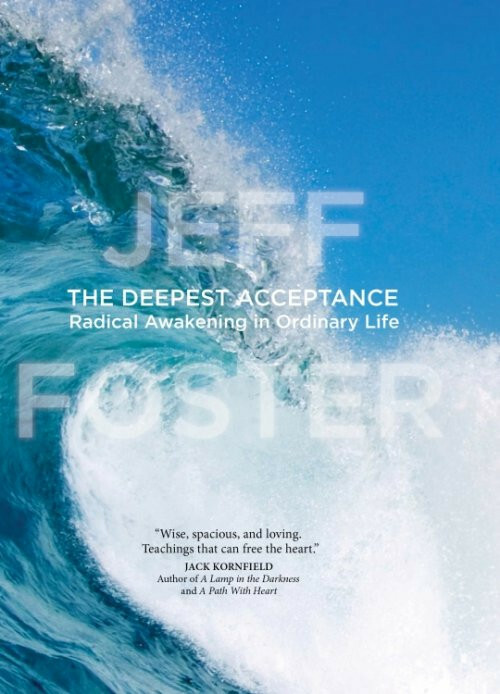 With Sounds True, Jeff has written a new book called The Deepest Acceptance: Radical Awakening in Ordinary Life and an accompanying audio program where he invites listeners to discover to discover “the ocean of who we are,” an awareness that has already allowed every wave of emotion and experience to arrive. In this episode of Insights at the Edge, Jeff and I spoke about how acceptance is actually what we are. We also talked about how to work with very practical concerns like our fears of financial insufficiency. And we talked about the power of meeting someone and being with someone who is suffering or who is in pain, and how to do this with an absolutely open embrace. Finally, Jeff and I spoke about the path of awakening that he’s travelled through experiences of deep depression and some of the most important discoveries he’s made. Here’s my very real, honest, and helpful conversation with Jeff Foster. Jeff Foster: Yeah, well you know, this is a radical message really that I teach. I’d say it wasn’t for the faint-hearted, exactly. I’d say it’s a basic problem of humanity, if we could speak about that. It’s that we’ve, on some level, we are afraid of life or we have become afraid of life, afraid of living. You know we spend so much of our time, it seems, turning away from life, turning away from ourselves; turning away from pain, turning away from fear, turning away from sadness, turning away from doubt. And I’d say that if I had to summarize everything that I have to teach it’s, stop. Stop turning away. And stay with life and turn towards life if you can. Face what is actually here. In the end, come to know it as yourself. It so often feels that life is somehow against us, you know? Or that life is doing something to us, or that life is going wrong, or that life is not going our way. My invitation is: stop and look at what is actually here. Come out of your story of your life—life is this, life is that, or this is going wrong, or that’s going wrong, this will happen, that will happen. Just gently return to what is actually here. I talk about the constant invitation of life. I see life as a constant invitation to simply return home, in a sense, to return to what’s actually in front of you—because that’s really all you’re ever dealing with, although it can often seem like it’s so much more. Just face what’s here. JF: That’s so true. You know sometimes life can get really, really challenging, and you know, we are faced with these waves. I talk in the book a lot about the waves in the ocean of you. If you see yourself as this vast ocean, all these waves are always appearing—thoughts, sensations, feelings—these are all the waves appearing in you. As you said, absolutely, oftentimes the waves can get really intense. These are big waves: waves of fear, waves of grief, waves of sadness, waves of fear, waves of doubt, and waves of joy, waves of bliss. I mean it’s all allowed in you. You know, it’s all essentially, what you are is the space for all of that. But as you said, sometimes these waves can get so intense and the truth is, we often don’t know what to do with them. Despite everything that we’ve learned and our spiritual evolution, all the experiences that we’ve had and all the insights that we’ve had, all the awakenings that we’ve had, still, sometimes these waves appear in very intense waves of grief, as you said. TS: Or like a tsunami, let’s say. JF: Like a tsunami, yes. Often I say that we’re told a lot about resistance; a lot of these spiritual teachings talk about resistance and how we’re always resisting the moment and we should stop resisting the moment, that we resist our pain, we resist our fear, and that we should stop. I think what I would say is that I think it’s probably more true to say that no one’s actively resisting their fear. No one is actively resisting their grief. It’s probably more true to say that we just don’t know how to be with our grief. And we don’t know how to be with our fear. It’s not that we’re resisting it. It’s more like we don’t know how to sit with it, how to be with it. Possibly because, no one has ever shown us how to sit with grief, how to be with grief. We’re taught, from when we’re very young, not to feel so much of this stuff. We’re taught that sadness is bad, or fear is bad, or anger is bad. So we spend so much of our time running away from these feelings, because really, who has ever shown us, whose ever held our hand in the midst of our grief, in the midst of our pain, in the midst of our doubt? Who has ever just sat with us and held our hand and for a moment, not try to fix us or change us or to get us to not feel that or to get us to try to feel something different? It seems to me that we’ve really forgotten, or maybe we never knew, how to be with these giant waves. And as I said that can be a beautiful place to start: just to admit your innocence, in a sense, to admit that with total humility—“Actually, I don’t know how to be with this,” —and to begin there. TS: Now, what would you say to the person who says, “You know, I don’t know how to be with this overwhelming something, whatever it might be—whether it’s fear or whatever—because of this intensity. It just seems there’s too much intensity there.” Sometimes I hear from people, “If I really let myself feel this thing, I’ll start crying,” and they say, “I’ll never stop crying if I start crying.” So what would you say to that person who has a fear of the intensity? JF: That’s so true. You know I often say, I don’t think we’re so much afraid of death, I don’t think anyone is really afraid of death, I think we’re actually afraid of life. We’re afraid of the intensity of life, because as you say, it can get so intense. And certainly over the past five, six years as I’ve been traveling around the world speaking to people and really going into this with them, I hear that so often. 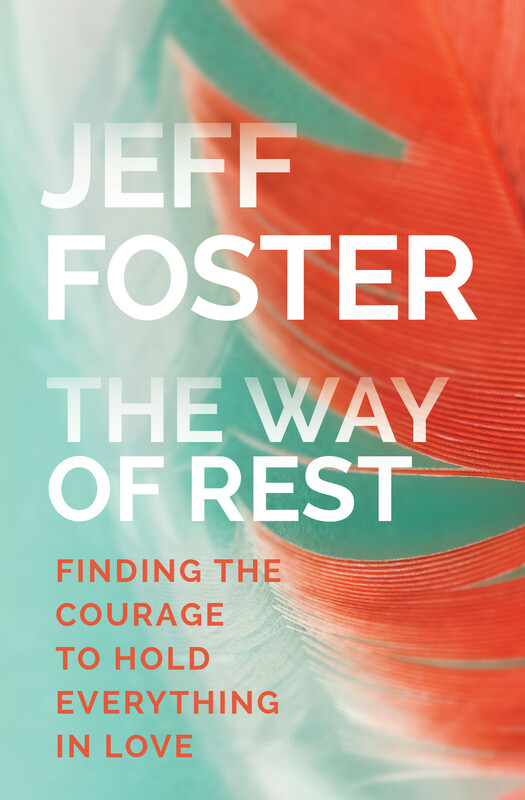 They say, “Jeff, I’m afraid if I really just allow this grief for just one moment, if I truly allow this, if this grief is let loose, if it was unrestrained, if I just stop for a moment running away from it, I fear that it would stick. It would never go away. It would destroy me. So we try to accept these tsunamis. This is what I say in the book. There’s so many people out there that I meet who are trying to accept this moment. They’re trying to say yes to the moment. There’s a lot of trying that happens; we try to accept the tsunami, but because of the fear and the intensity in that moment, we just feel unable to accept. We feel unable to allow. So then we’re faced with the tsunami and, in the moment, our own inability to accept it—our own inability, our failure to accept it. So then that becomes the truth of the moment is that there’s this giant tsunami and there’s, in this moment, a sense of inability to face it. What I say in the book [is] actually, that’s not a failing of yours. That’s not actually a sign of your failure, that fact that you feel unable to accept this moment. There’s a much deeper truth contained there. This is why I speak about the deepest acceptance. I talk about acceptance not as something we do—what I say in the book is actually acceptance is who we are. It’s another name for you. Acceptance is another name for who you are. Peace and rest and freedom and all the good stuff that we’re looking for—it’s not actually a case of doing something to get there, it’s more a case of remembering how you’re actually built. You’re built as acceptance. That’s your true nature. TS: Now can you explain that a little bit more? I’m not sure I’m following you, exactly, that acceptance is who we all are, because you see a lot of people who don’t seem to be particularly accepting. JF: That’s so true. Acceptance is who we are. It’s how we’re built and that’s what we forget. I would say that’s probably the problem of humanity—and all conflict, and all suffering and all violence, and all destructive behavior actually emerges from that forgetting of who we are. So if you’ve ever meditated—maybe this is a way of talking about it in the most simple way. If you’ve ever meditated, you’re sitting there watching thoughts come and go, maybe watching sensations come and go, and it starts to dawn on you that maybe you aren’t who you thought you were because if thoughts can come and go, then they can’t truly define who you really are because who you truly are in your essence can’t come and go. It can’t come and go. It can’t appear and disappear. Who you truly are, is always, always here. It’s always present. I think everyone in the world has that basic sense of being here, existing right now in this moment. We can doubt everything, everything we’re told, everything we’re taught except the fact that we exist right now. There’s a sense of being here. It doesn’t really matter where we are. It’s not being here, or being there, it’s being where we are—wherever we are in the world, it’s being where we are. Everyone has that sense, and that’s what I call the ocean, the ocean of consciousness, the ocean of awareness. So you’re sitting in meditation, you’re noticing thoughts coming and going, and feelings coming and going, and sensations coming and going, and you start to realize that actually, who I am can’t be thoughts, who I am can’t be feelings, who I am, in my essence, can’t be sensations, because they all come and go. So you start to notice that there’s something here that doesn’t come and go that’s always present, this ocean of who you are—this is what I call it: the ocean of who you are. So you start to notice that within that ocean of who you are, within this ever-present wide open space of you, all the waves of life are always appearing and disappearing. Thoughts come and go. Sensations come and go. Feelings come and go. All the waves arise and dissolve in the ocean of you. Who you are always remains. So when I talk about acceptance, I’m talking about it is a different way, perhaps, [than] we’ve used the word before. So acceptance is not a case of me [doing the] accepting: I have to accept this moment, or I have to accept this fear. I have to accept this pain. You could say that on a deeper level, who you are as the ocean is already accepting or allowing its waves. Every wave that arises in the ocean of you is in a sense already accepted. It’s already allowed because it’s appearing, because it’s here. So if a thought is appearing, it means on the deepest level, the ocean of you, is already allowing that thought. If a sensation is appearing right now in your present experience, it means that who you are in the ocean of you is allowing that sensation. It’s allowing this feeling. It’s allowing this sadness. It’s allowing this pain. It’s allowing this joy. If a wave is arising in you, it means on the deepest level that who you are in a sense has already said yes to it. And in a sense, who you are has already said yes to this moment exactly as it is. So these thoughts, these sensations, these feelings, even this doubt or this confusion or this pain that’s appearing right now—on a deeper level, who you are is allowing it, who you are is accepting it, who you are has said yes to it. So even if it seems, on a surface level, it seems unacceptable to you, to the mind, to the thought—your thought might say, “This sadness shouldn’t be here.” Or a thought might say, “This is too much sadness.” Or a thought might even say, “This isn’t enough sadness, because thought is always comparing—but on a deeper level, who you are as the ocean is already allowing this sadness. This sadness has already been welcomed into you—that’s why it’s here. I mean in a way, this goes completely against our common sense of what we’re taught and it can seem, even when you first hear it, it can seem even crazy or confusing. But really, it’s not something that you believe; it’s something that you begin to notice in your own experience. It’s like life becomes this constant meditation, noticing thoughts, noticing sensations, noticing feelings, and then noticing on a deeper level, that whatever is arising in this moment, even if it’s very intense, even on the most basic level, it’s not your enemy. I think that’s the core realization, that if sadness is arising in you, even if it’s very intense, it’s not your enemy. No wave is against the ocean. It’s already being allowed in you. So what I would say is life is just this never-ending invitation to remember this already accepted nature of present experience. So acceptance isn’t something that you do. It’s not “I accept this moment” or “I don’t accept this moment.” It’s noticing on a deeper level that this moment has already been accepted. So that’s what I mean when I talk about the deepest acceptance. It’s an acceptance that goes beyond “I accept” and “I don’t accept. In a sense, it’s total surrender actually to life. It’s total surrender. It’s like recognizing your total humility in the face of life. But it’s not a place of powerlessness and passivity. I’d say it’s the absolute opposite, because it’s discovering this inner built-in “yes” to life. It’s a “yes” to every moment, [but] not as something that you have to strive to do. It’s not like I have to strive to say “yes,” because that becomes so exhausting, I think, trying to accept this moment even when this moment becomes so difficult. We try and try and try and we try and we try and we try and we try to accept it. It can become so exhausting, trying to accept this moment. Bur even that exhaustion is part of the invitation—to notice, to give up trying to accept, and notice that on this deeper level this moment has already been allowed in. These thoughts, these sensations, these feelings, these waves of experience have already arrived, so it’s too late, in a sense, to fight them. It’s too late to accept them and it’s too late to fight them because they’re already here. TS: Is it fair to say, Jeff, using this metaphor of the waves and the ocean—from a kind of practical, on-the-spot [perspective] that if somebody find themselves deeply identified with some kind of very intense wave of experience that seems difficult or overwhelming, that if they shift their attention to the oceanic nature of our experience, that that makes room from this acknowledgement of acceptance? What do you think about that? Shifting to being the ocean versus identifying with the wave. JF: Well, that’s it really. It’s all about remembering your true identity as this vast, spacious ocean, rather than identifying as this small limited person. Every moment is this invitation to remember that actually you are much vaster than you ever imagined. You know, I think that’s what goes to the core of so much suffering, especially the people I’ve met over the past few years. There’s this sense that when we’re suffering, that somehow we’re somehow too small, we’re too limited to take this. This pain is too much for me, or this fear is too much for me, or this grief is too much for me. That’s how it can feel, but of course in reality, this moment is never really too much. Whatever is going on in this moment, even if this moment is very intense and full of pain and full of fear, you could say that there’s something here that is already holding this moment, it’s already embracing this moment. It’s already allowing this moment to be, even if you feel personally unable to bear this moment, that you fell unable to take this moment. You feel unable to accept this moment. What you are as this vast oceanic space is already holding the fear. So suffering is really all to do with identification. For example, when there’s a wave of fear—and it could be anything, it could fear, it could anger, it could sadness—that’s an invitation to remember who you are. Who you are in this moment is holding the fear, who you are is the space for that fear. What I am in this moment is the space for this fear. In a way I’m giving this fear space. You know, I’m giving this fear breathing room. I’m making it safe for this fear to express itself. I’m making it safe for this pain to express itself. I’m making it safe for this sadness, for this doubt, to express itself. In a way, it’s completely the opposite of everything we’re taught about ourselves. It turns life upside down but we remember ourselves as this vast ocean that is allowing these waves to be. In a sense, these waves, a wave of fear is not the enemy. That’s what we’re taught, maybe. A wave of pain, a wave of sadness is not the enemy; as the ocean, you could say it’s one of your children, you know? As the ocean, you give birth to a wave of fear, you give birth to a wave of sadness. These are not enemies to be destroyed, these are children to be held, to be loved in this moment. Life doesn’t ask any more of you than that. You’re only facing this moment of fear. When we go into the identification, when we forget our true identity, as you said, the ocean, this vast ocean, this vast space in which fear is appearing right now. When we forget how vast we are, we forget how spacious we are. We forget how loving we are, in a sense, how deeply embracing we are. We start to identify with that wave. So, instead of remembering ourselves as the vast ocean in which fear is coming and going right now, we identify as someone who is afraid. I think that’s the fundamental difference between remembering who you really are and forgetting who you really are. It’s that identification. So we remember ourselves as in this moment, and it’s only in the moment, because that’s all there is, ultimately. [If] we remember ourselves right now as this vast ocean in which this wave of fear is allowed, and we don’t identity as “I am the one who is afraid,” or “I am the one who is sad,” or “I am the one who is in pain, I am the victim—” because there’s always some kind of victim story behind that. [Doing] this is not a denial or a rejection of the wave. It’s not pushing the wave away. It’s not saying “Oh that fear can’t touch me. I’m beyond fear.” You know, all the spiritual bypassing stuff that we do sometimes. It’s not about that. It’s about acknowledging that the fear is here—acknowledging it, noticing it—and at the same time as remembering yourself as the wide open space that’s holding that fear. So the fear is allowed to move in me, but ultimately, it doesn’t define me. So it’s both. It’s like allowing the fear to fully express itself without pushing it away. But at the same time remembering yourself as this vast space. TS: Now Jeff, for whatever reason, I’m thinking about somebody who might have a fear—let’s say of financial insufficiency of some kind. Like, I’m just not going to have enough money. And this is all great, this spiritual talk that Jeff’s giving about remembering the oceanic nature of consciousness, but I really need to attend to this fear about not having enough money and kind of get it together here and mobilize and if I rest in this oceanic place and [don’t] really concern myself exactly with this fear, I’m not going to manifest practically the way I need to. How would you respond to that? TS: I’ve asked a question that you get asked a lot, but that’s ok. That’s ok. I’m alright with that. JF: [Laughs] It’s not an original question, Tami. TS: It’s ok. I can roll. JF: You can roll. [Laughs] That’s good. It’s interesting, I was talking to a woman last week and we were having this [same] conversation and there was this possibility that she might lose her house in a few weeks, might not have anywhere to live. And so when she came to me, she was obviously full of anxiety and stress. She was talking, talking, talking very, very fast. “What about this? This might happen. That could happen. I might not have anywhere to live. I might not have any money. I might be homeless.” You know? So there’s a relative reality to all of that. That could happen. In a few weeks, she might have a house or not have a house or have money or not have money, but the point was that in this moment, she was trying to work it all out. She was trying to get all the answers right now. She was exhausting herself, trying to fix her life in this moment. So what I did is, I just invited her, to just for a moment, instead of trying to fix her life and come up with a solution right now—I wasn’t saying that the solution wouldn’t ever come. I wasn’t saying that she was never gonna have money. The point is, in this moment, she didn’t know. In this moment, she hadn’t found the answers yet, she hadn’t found the solutions yet. They might come. I think that’s a very primal fear, actually. If I sit here and just for a moment, do nothing, my life will fall apart. I think that’s really fascinating that we have that fear: if I sit here and do nothing, just for one moment—because that’s all we’re asking— my whole life will fall apart. So it’s interesting with this woman I was speaking to, I just gently invited her to come back to breathing and begin to just feel the sensations in her body and just feel the fear, actually. Where was the fear in her body? She pointed to her stomach and her neck and her throat. And I just asked her to bring some attention back to the life, the life that she was, the life that was actually moving in her, the tingly alive sensation that was moving in her now, to come out—in a way—to come out of this story of MY life. My life and my problems, and my solutions, and in three weeks time I’ll be homeless, to come out of that just for a moment [from] the story of my life and in a sense return to life, to remember the life that you are, to remember that life that she was. And then what was really interesting, as she just allowed herself to actually feel the sensations in her body, and actually feel the fear rather than running away from the fear, trying to solve the fear—because in a way that’s all she was doing. She was trying to fix, present fear. She was trying to get rid of present fear by solving the story of her life, by fixing the story of her life, like she was coming out of “life” in a way and going into the story of “MY life.” But the point is, it wasn’t working. It was just causing exhaustion and stress and no answers were coming. The answers hadn’t come yet. What was really interesting was that she just relaxed into her body and started to honor the fear, rather than running away from it, started to acknowledge it and to honor it and even to share it with me, to meet fear, actually—not to try to fix fear or push it away, but to actually meet it. That’s when she started to relax and suddenly, her life didn’t seem like such a disaster and suddenly it wasn’t such a catastrophe. And the funny thing is, from that place, that’s the creative place, the mystery of this moment, that’s the source of all creativity. If answers are going to come, this is where they come from—the mystery of the moment. They don’t come in the story of three weeks time. The answers that we long for, they emerge in their own sweet time out of this mystery and it’s like the mind is—it’s very sweet—the mind is trying to solve our lives for us. The mind is a beautiful tool and we don’t want to get rid of it and we don’t want to make it into the enemy, but sometimes life just invites us to come out of that story of “my life” and “solving my life” and “fixing my life” and just remember the mystery that you are. TS: Now Jeff in this story that you directed this person, helped this person sit with the feeling of fear that was in her body, and it seems like that is a really important step and one that can be hard for people, especially if they haven’t trained—at least in my experience—in some form of embodied focus and attention. How do you help people stay with that, stay with the physiology of what’s happening inside of them? JF: I guess what I do, if I could summarize what I do with people, is I don’t do very much, actually. I don’t experience myself as doing very much with people. For me, it’s about meeting them, you know? I think so often, when we sit with someone, we meet someone, we’re in a conversation with someone, and they’re expressing fear, or they’re expressing pain, or they’re feeling doubt or confusion, so quickly we rush to help them or fix them or solve their problems for them. If someone is experiencing a lot of fear, maybe out of compassion, out of love, we try to stop them feeling what they’re feeling, or we quickly offer solutions or maybe we even pretend to have some kind of answer. What I tend to do with people—I don’t do that so much. I find that what truly heals—I mean, this is my own experience with people—what truly heals is this meeting, this being with. I’ll sit with someone who’s experiencing a lot of fear, and they’re going into this fearful story of “This will happen, that will happen, I won’t be able to eat, I’ll be homeless, I’ll d ie, I’ll end up in a ditch somewhere.” I don’t give them answers. I don’t try and fix them. I don’t pretend to have the solutions. I’m just very honest about that. I don’t pretend to know anymore than they do. What I think I do— and I wouldn’t even say it’s a doing, actually—I just provide the space for them to meet their own fear. If I’m able to sit there and meet them as they are, and not turn away from them, and not try to fix them, and not give them easy answers or try to prove what a wonderful teacher I am because I know so much—it doesn’t interest me. You know? It doesn’t interest me. What interests me is really meeting [them]. As I was saying before, I think that’s what we’ve forgotten as a species. We’ve forgotten basically how to be with ourselves. That’s actually where all of our suffering begins is this forgetting of who we are, which is the forgetting basically of how to sit with ourselves, how to sit with our fear. No one has ever shown us how to sit with fear. People have taught us throughout our lives how to get rid of fear, how to escape fear, how to turn fear into something else, but who’s ever shown us how to be with fear in the moment of fear—facing the fact of fear, sitting there facing the fact of fear in the present moment. Who has ever shown us how to just stay there? We’re given so many techniques and solutions and methods of how to get rid of stuff. So hopefully what I do with people, perhaps because of my own experiences over the years, I’m far more able these days to sit with my own experience. I’m far more able to sit with fear, to sit with sadness, to sit with confusion, to sit with doubt in myself because I’ve learnt over the years not to run away from it. I’ve learnt that actually running away from this moment does not provide what we truly long for. However paradoxical that sounds, you know, it’s actually this turning towards, this staying, stay, stay, stay, stay. I think that’s the constant invitation of life is to stay, stay, stay. Even if in this moment, you feel that you can’t stay, stay with that. Stay with that. So I think for whatever reason, [since] I’m more able these days to stay with my own experience, I’m far more able to stay as well with someone else’s experience and not run away from it and not try to fix it. TS: I think you’re actually pointing to something really important, which is the power of being with another person when we can unconditionally accept whatever it is they’re going through. I think you’re actually pointing here to something really important about how we can be there for others. JF: I think that’s the very essence of healing and the true meaning of the word. What I would say is that for me, healing has nothing to do with the running away. It’s got nothing to do with fixing. Healing has nothing to do with fixing yourself. It’s got nothing to do with fixing people. It’s all about this staying with our experience, even if in the moment we feel like running away, even if it feels so uncomfortable to stay there, even if we’re sitting with someone who’s experiencing a lot of sadness or doubt or confusion or anger. When we’re sitting there with someone who’s in that moment, expressing anger towards us and it’s aimed at us and they’re calling us names and they’re saying that we did these things. They’re judging us. Often what happens at that point is we start to feel uncomfortable. We start to feel hurt. We might even start to feel the urge to run away, either literally run away or psychologically run away from them by just withdrawing and numbing ourselves to them, pushing them away psychologically, or we might even feel the urge to attack them because we feel attacked. We feel hurt. We don’t know how to be with our own hurt. We feel hurt and we don’t know how to stay with that. We don’t know how to be with that. So we lash back at them—there’s that urge to lash back them. So this is the invitation of life, and this is the invitation that I offer and this is the invitation I speak about in my book. Can we just stay there in that place, even if in the moment there’s a lot of discomfort moving in us, there’s a lot of hurt moving in us? Can we stay with our own experience? In the end, that’s all we can know. Can we stay with our own experience, even if there’s hurt, even if we feel hurt? Can we find the place in that moment, where that wave, that intense wave of hurt moving in us, is allowed to be there? Can we find our inherent vastness? In that moment, can we just stop and notice that who we are is vast enough? Who we are is oceanic. Who we are is big enough to contain that hurt, to hold that hurt, even if it’s burning, even if it’s very intense, even if there’s a strong urge to run away or the strong urge to push the other person away or attack them or fix them, manipulate them, or try to change their experience. Can we stay with all of that? Can we find the place where actually all of those waves moving in us, just for this moment, are allowed to be here? Can we remember that who we are is vast enough to hold that hurt and then to meet the other person in that place of deep acceptance? I’ve had so much experience with this over the past few years, especially being a teacher, you know? It’s one thing having all these insights and having an awakening experience, but it’s a whole other world going out and teaching it, because you’re exposing yourself to all kinds of situations and all kinds of people. You’re really opening yourself up for attack, for people to disagree with you and to not like how you teach or to not like what you’re saying, because it’s really challenging. A lot of the stuff that I talk about can seem quite challenging to people, and it’s understandable. I’ve been in situations, many situations the past few years, where I’ve been sitting with someone and they’ve been very angry with me, or they’ve been disagreeing with me very strongly and calling me this and that. I mean, it hasn’t happened a lot, but I’ve certainly experienced this. For me, it’s always an invitation to deeply allow that, in that moment, whatever waves it brings up in me. Because I’m not immune. There’s no such thing as anyone who is immune from life. And I think that we have this funny idea that awakening, or some people have this funny idea that awakening or enlightenment, is a place of numbness, or a place where you don’t feel all these waves, you don’t feel sad anymore, or you don’t feel pain anymore, or the waves have somehow become a lot more gentle. In my own experience, it’s actually the other way around. Because the waves are allowed to move, actually the waves become a lot more intense. The waves become a lot more intense because you lose interest in pushing them away. You lose interest in numbing yourself to life because you want to live. You know, I spent the first 25 years of my life—I was basically dead. I was numb. I was absolutely numb to myself and to other people. So I’m not interested in numbing myself to life anymore. I’m not interested in pretending to be the enlightened one who doesn’t feel anything. That doesn’t seem possible and it doesn’t seem human. What really interests me these days is meeting other human beings in this place of deep acceptance, you know—noticing all these waves moving in myself and finding the place where they’re all allowed to be there, they’re all held. That’s how, actually, that’s how we stop turning against the one in front of us. That’s how we can break the cycle of violence and conflict because we’re allowing ourselves to feel hurt just in this moment and we’re remembering ourselves as the vast, unlimited, open space of consciousness that allows this wave of hurt. It doesn’t reject hurt. It says “yes” to hurt, however strange that sounds. It says “yes” to hurt. In a strange way, that’s how we don’t become hurt, by discovering this inner “yes” to hurt. That’s how we stop the identification of, “I am the hurt one. I am the hurt one, you hurt me. I am the hurt one. I am the victim of you.” I think that’s where all violence, where all conflict begins, is with the identification as some kind of victim. You know, you hurt me. You hurt me. So remembering ourselves as this vast ocean in which the hurt is allowed—so it’s not pretending the hurt isn’t there. It’s not pretending the hurt isn’t there. It’s acknowledging it. It’s feeling it deeply, but it’s allowing that hurt to move in you so that it doesn’t get stuck. It flows and it moves. And you remember on the deepest level that it can’t hurt you, that what you are, as the ocean, isn’t going to be hurt by this. It might hurt, but you won’t get hurt. I think that’s the fundamental realization, and that’s how in my own experience how I’m able to stay with people—even when they’ve become quite violent or agitated or angry, to stay with them. Underneath all of that, of course, you see their pain. You meet their pain—and that’s where compassion can begin, is when you remember that all this destructive behavior is coming from pain, from unmet pain. It’s coming from unmet pain. They simply are not able in this moment to meet themselves. So maybe I can meet them. And that’s—for me, what it’s really what it’s all about in the end. Life is all about this meeting—that meeting ourselves, meeting our own pain, our own fear, our own bliss, our own joy—meeting all those waves in ourselves and meeting the one in front of us in the same way actually. Because in the end, it’s the same meeting—we’re really just meeting ourselves. It’s become a bit of a cliché these days but it’s so true: we really are only meeting ourselves in disguise. We’re not nearly as different as we like to believe. TS: And they may not know but you are young person, you’re in your early 30’s. Is that right? JF: That’s true. Yeah, I’m thirty—what am I? I’m 32, I think. TS: Yeah, there you go. Something like that. TS: Thank you. We can check the records, find your birth certificate or whatever. But you know what’s interesting, I think and what I think people would love to hear more about is your own process. You talked about how the first 25 years of your life, that you now in retrospect see that you were “numb.” But I’m curious to know, you’ve written a little bit about how depressed you were, to the point of a type of suicidal depression but then your situation changed. You had some breakthroughs, some insights, and here you are now helping other people. So tell us a little bit about your own story here, especially the depression and what shifted that. JF: Sure. I was always a depressed child, depressed teenager in life. If I had to sum it up, life always felt so heavy for me. I would wake up every morning, and you know, this was 25 years of this, ever since I could remember, I would wake up every morning and life just felt, heavy, heavy, heavy, heavy. I was intensely shy, and intensely self-conscious. I don’t think I’d, I mean I barely spoke to anyone until I was about 20, which is why it’s quite ironic, considering these days I go around the world speaking to people and doing meetings and workshops. It’s funny how life can change like that. I was intensely self-conscious and it became worse and worse, and I was just filled with so much self-loathing and I hated the way I looked. I just hated myself. I just felt totally inadequate. My life totally lacked any kind of intimacy. I was unable to share anything with anyone. I was terrified of expressing myself to anyone out of this deep fear that if they really saw what was going on in me, if they really saw who I was, if they saw beyond the facade, they would reject me. They would laugh at me. Or they would never want to speak to me again. You know? I was just someone who kept everything, everything in really. I really never had any friends. I never had anyone to speak to, really. I was kind of dying on the inside. It got worse and worse, really; through university it got worse and worse. I was 22, 23, 24—I can’t really remember—I was living in London, working in the BBC. I thought I was going to go into television back then. I was working in night shift. I hated my job. I was in this relationship with this girl and it was very obsessive. I thought she was the one. I thought she was going to complete me. I’d found my soulmate. And she didn’t agree. [Laughs] And that all fell apart. I just hit rock bottom. I think around the same time I got quite ill as well. I ended up in the hospital. It was a kind of breakdown. Looking back I can say it was a kind of breakdown, but I think something had to shift, something had to break down, it couldn’t go on the way it was going on. I think one event that really started to change things was I had some kind of near-death experience. I mean, I realized it was that now, maybe at the time I didn’t realize it. It was some kind of near-death experience. One day, I was at absolute rock bottom. And I took the day off work because I felt so bad. I suddenly felt the need to run into the bathroom and I started vomiting, and I was vomiting blood. I started to panic and started to lose consciousness and I fainted. I woke up, I don’t know how long it was afterward— maybe 5-10 minutes later—and I had fallen into my shower and there was blood all over the shower. I remember not being able to breathe and I tried to scream for help and nothing would come out. I really had the sense, “Well, this is it.” You know, you hear these stories sometimes about people vomiting blood out of nowhere and then five minutes later they’re dead, and it really shook me to my core. It absolutely shook me to my core, lying there with blood all around not being able to scream, not being able to get up. I thought, “This is it then. This is the end. This is how the story ends.” And I think that was the start of something. TS: Now, Jeff, just to ask a question, did you have the kind of classic near-death experience where you leave your body and all of that, or was it more that you just had a complete freakout experience, that you found yourself in a pool of blood in the shower? It started to get these questions churning in me. Questions I’d never, ever asked before. I was a real kind of—I mean, I’d been educated as a scientist. I had a very rational mind and I was a total atheist at that point—no interest in spirituality, no interest in anything to do with spirituality at all. It was all just gobbledygook. It was all just made up. You know? But this started something, because in my own experience, I felt I’d come close to death of some kind. Or at least the realization that death is so close and life is so precious. I think that’s what it started off in me, was this sense that “My God, this life is so precious, this moment is so precious, what the hell am I doing with my life? I’m working in a job that I hate. I feel totally constrained and held back. I’m not nearly beginning to live any kind of life that I want to.” It was like I was living some kind of robotic, secondhand life: go to school, go to university. Get a degree. Go and get a job. Get married. I was on the treadmill. TS: So you can say that in a sense, you hit bottom at the moment. Would that be fair to say? JF: I think I hit my first bottom. JF: And there were more bottoms to come. [Laughs] But that first bottom definitely set something off in me. So I found myself in the hospital a few hours later and I remember very clearly I reached out, I found myself reaching out to a copy of the Bible, which was in one of the drawers by my hospital bed. It’s something I never would have done in my whole life before that. So something in me was—it was like the seeker was born somehow. The spiritual seeker had been born, looking for answers, looking for some kind of meaning to life. What does all of this mean in the face of death? What is death? What is life? And who am I? And these questions started moving in me but it wasn’t—I mean, I needed the answers to these [questions] now. This wasn’t a game anymore. I needed to know who I was, and I needed to know what death was and who dies. What does life mean? So that’s really—for the next year, couple of years, I became a totally obsessed spiritual seeker. I read and I read and I read. I read every book about awakening and enlightenment that I could get my hands on. But for me, I think it was all about death, really. It was about death and it was about suffering as well. I think at some point I read some book about Buddhism and about spiritual enlightenment. I’d never heard of spiritual enlightenment before. Suddenly, I needed this. Spiritual enlightenment, this is going to be the end of all my suffering, because I had suffered so much. I was suffering so much. So it became this obsessive, year-long, maybe two years, search for spiritual enlightenment. Really, I locked myself away. I moved back to live with my parents for awhile. I locked myself away quite literally in my room maybe for a year, two years. I mean, it’s all a bit blurry now. And I read and read and read and I started meditating. All kinds of self-inquiry practices, but it was all with the aim of becoming enlightened, you see? It was all with some future goal in mind. One day I’ll become enlightened and all my suffering will end. TS: We need to keep going with your story here, because I think at this point, many listeners may be identifying with you in a certain sense. Like, “Yes, I also not had, but have this deep passion to know who dies. That’s why I listen to Insights at the Edge podcasts ad nauseam, again and again and again,” — [like] many listeners. And so keep going, Jeff, because beyond this, you had some types of breakthroughs that really led you to your work with The Deepest Acceptance. JF: Well, yes. I mean, it was an incredibly intense few years actually. As I said, I became totally obsessed with enlightenment. I was really doing everything I could to become enlightened. I never actually went to any teachers. I never went to any workshops or retreats or satsangs or seminars, or anything. I guess that was just my character at the time. I had this fire in me and I kind of wanted to do it all myself. I had this sense, I remember a long time ago having this very strong sense that if there’s anything such thing as peace, if there’s anything such thing as freedom, if there’s any such thing as awakening, I’ll find it on my own. I’ll find it here. I find it here in my room, here in my backyard. I had that sense from the very beginning. Maybe it was a kind of stubbornness, maybe it was kind of shyness. I was still so shy, I didn’t want to reveal myself to other people. I was going to keep myself to myself. I don’t know what I was thinking, actually, but it was this kind of obsessiveness of, “I’m going to do this myself.” So I started reading all the books about enlightenment, and the enlightened teachers and the breakthroughs that they had had, and their enlightenment experiences, and one day they were walking down the road and suddenly the self fell away. And you know the story of Eckhart Tolle—you know, he’s lying in bed and suddenly it all becomes clear. So I started trying to make this happen for myself. Because back then, this is what I thought awakening was—I thought it was some kind of event that would happen one day, some experience that would happen one day. So as the months went on, I became more and more obsessive really and I mean I had all kinds of insights over the months, years, actually. I had all kinds of insights, all kinds of experiences, as many spiritual seekers do along the way. You have moments, hours, days sometimes, of just deep bliss and peace, and then that passes and you want that experience back, or you have some kind of experience of total oneness and then that passes. Or you have some experience of no thought— thought disappears for you know minutes, hours, days. I mean, you don’t even know anymore. But then that passes and thought comes back. I would have all these experiences, I think, as many people do, but something still wasn’t satisfied. I was still looking for something. It got to the point, actually, that I didn’t even know what I was looking for anymore. I didn’t even know what I was looking for. I just felt I had to keep on looking. It can’t be this. It can’t be my present experience—whatever it is, whatever it is that the spiritual teachers are promising, the gurus, the spiritual teachers, whatever they’re promising, it can’t be my [current] personal experience. That was the basic sense—whatever I was looking for, it was somewhere else. It was in the future. So no matter what I did, I couldn’t get there. The experiences would come and go—the experiences of just total bliss, total orgasmic bliss. Beautiful, but they would pass and then I was always waiting for the final experience, the final enlightenment, awakening experience, and it would never come. I was really hooked on that. I was really hooked on that idea of a future awakening, really hooked. In my experience, that seemed to be what some of the spiritual teachers were talking about—at least the ones I was reading—that awakening was something in the future; it was something that would happen one day. So really, the upshot of all of this I became totally, totally exhausted. I was totally exhausting myself. I really just lost touch with the outside world. I’d gone into my little cave. I didn’t have any relationships at that point. I didn’t have any friends left, I don’t think. I wasn’t really talking to anyone about my experiences. There were some points, [where] sometimes, I even thought I was enlightened. I went through that as well. I had certain experiences and I came to the conclusion right, I’m enlightened. I would go to bed at night [laughs] believing that I was fully enlightened. And of course, I’d wake up in the morning, and forget it. I was really driving myself mad, but I couldn’t find a way out. So it just got to this point of total exhaustion with the whole spiritual—anything spiritual, really. I was just drowning in these spiritual concepts. And at that point, I’d gotten into Advaita and nonduality, which some of your listeners might have heard of. I was grappling with all these concepts like, there is no me, and there’s no self, and there’s no time, and there’s no space, and there’s no choice, and all this stuff was swimming around my head. So it reached this point of total exhaustion. So I was lying there on my bed in my bedroom—this was the bedroom I’d grown up in, it was the same bedroom—and I just remember, for some reason I just glanced over at a chair. I was just looking at the chair in my bedroom. This was a chair that I’d seen thousands of times before. It’d been there since I was a child. It was an old, familiar chair. And I guess, suddenly something that just clicked or dawned on me. Or I remembered something, or something became obvious. It’s very hard to actually put into words because it wasn’t this big thing, really. It was the sense of “oh, of course! Of course.” It was like something very familiar. Something I’d always known, something that had always been on the tip of my tongue, something that had always been with me. It wasn’t like a new experience. It was something that had always been with me. And there was the sense that, “Oh my God, this moment is what I’m looking for. This moment is what I’ve always been looking for.” I mean, this might sound really strange, but there was this sense of “Oh my god, it’s the chair. It’s the chair.” [Laughs] Because I’d been—for years, maybe for my whole life actually, I’d always been looking for something, not even knowing what it was. Especially as a spiritual seeker, I’d been looking for enlightenment, this big experience, the fireworks. I wanted the fireworks. And this didn’t come in words; it wasn’t really the mind understanding this. It was much deeper, much more primal than that. “Whatever you’ve been looking for, Jeff, you were never going to find it outside of what is actually here.” I remember at that point, I think I burst into tears. I was weeping. I think it went on for about an hour, actually, because there was just this sense of total humility and gratitude. It was like gratitude for a chair! It’s very hard to explain really. It was like something as ordinary and simple as a chair. I’ve been overlooking this [for] my whole life because I’ve been looking for something else, something more: wanting success, wanting enlightenment or wanting whatever, and I’ve been overlooking the chair, which has always been here, offering itself freely, asking nothing. Life itself has always been here offering itself, and I’ve always been ignoring it. I’ve always been pushing it away or ignoring it or being ashamed of it, or just not acknowledging it. It was like for the first time, I was acknowledging the chair—however strange that sounds. Then I remember looking around and my attention moved from the chair to the carpet. It was just a very ordinary carpet, and there was just this sense of, “Oh my goodness, it’s also the carpet.” [Laughs] It sounds funny when you talk about it. Whatever I’ve been longing for on the deepest level, it’s appearing right now as this chair and this carpet. I remember walking around the house, looking at everything, as if for the first time. I mean it really was—it sounds like a bit of a cliché—but it really was like seeing everything for the first time. Just seeing everything in the house without Jeff, actually. Seeing what life was like without Jeff, without the seeker, without Jeff looking for something, without this Jeff character who always felt incomplete and who always was looking for some kind of future completeness. It was seeing life without Jeff, and the carpet and the walls and the lights, and then opening the window. And then, “Oh my goodness, there’s also all of that!” It was like, there’s also trees, and cars, and roadwork, and dogs, and dogs making a mess, and houses. There’s all of it. And then I remember looking down at my body, and I thought, “Oh my God, this is also part of it!” because for so long, I’d been stuck in all these spiritual ideas that the body was somehow an enemy, or enlightenment was the end of the body, or we should get rid of the body, or that we should transcend the body. It was like this realization turned everything on its head. Because now, I knew now—and this really hasn’t changed, I think this was the fundamental, fundamental realization, this really hasn’t gone away—is this sense that whatever is arising right now, whether it’s chairs and it’s carpets, and it’s trees and it’s cars, or it’s thoughts, it’s sensations, it’s feelings, these waves of sadness or a wave of fear—on the deepest level this is all sacred. This is all sacred and it’s all beloved, in a way the mind will never comprehend. I’d spent so many years trying to understand this intellectually, or trying to reach some intellectual understanding, and I guess I realized at that point that this isn’t something to be understood intellectually. It’s about noticing what is present, what is here, what is given. So I remember looking down at the body, at the hands and the feet and the legs and the hair and all the imperfections suddenly just seen without the seeker, without the story of perfecting myself in the future, without the story of becoming enlightened. Seen in the light of this embrace, even my imperfections were so perfect in a sense. They were all just perfectly positioned. There was a sense that everything was in its right place, and in a way that I could never comprehend. This wasn’t like an intellectual game I was playing with myself. It wasn’t like believing that everything was perfect; it was actually seeing this inherent perfection that was not at war with imperfection. I think that was the fundamental realization. It completely destroyed all of my old concepts about what perfection was. Before that, I’d always seen perfection as some future state, or perfection was about getting rid of imperfection. This turned the whole thing on its head, because now perfection was all about this total embrace of imperfection—this embrace of thought, sensations, feelings, sounds, and smells. So I guess I just remember falling to my knees and just weeping. I think I just wept everything out really. So I think that experience—or that non-experience or whatever you want to call it—I think that really broke the back of something. That really was the beginning of the end of my spiritual seeking. I think it really— it’s like my whole life turned around after that, really, because life was no longer about me, Jeff, trying to get somewhere, or me, Jeff, looking for something, or me, Jeff, just trying to become enlightened. It was all about this remembering that every thought, every sensation, every feeling is on the deepest level sacred and accepted by life, not by me. It’s accepted and acceptable to life. And I think from that point, you know, it’s not the, “Oh after that point, all my suffering fell away and everything was perfect.” I think we love those awakening stories, but I’ve never met anyone who that’s actually true for—they have an awakening experience and then all their suffering falls away and it never comes back. I think what this experience—or this non-experience, or whatever you want to call it—I think what it did do for me is it completely changed my relationship with suffering. What I realized is that basically suffering was, at the most basic level, suffering was and is the pushing away of life. Suffering is our attempt to escape what’s here, to run away from what’s here, to deny what’s here. It’s a forgetting of who we really are. It’s a forgetting of this already accepted nature of experience: that thoughts, sensations, feelings, are on the deepest level already allowed in us, in this moment. So the end of suffering—now I realize that the end of suffering wasn’t some big event that was going to happen one day. The end of suffering was actually contained in my present experience. It was this remembering to turn towards what’s here. So then what I saw was that every time I suffered, every time I was struggling in my life, it was actually an invitation. It wasn’t a mistake. It wasn’t a punishment. It was an invitation that in that moment, I was forgetting something. For years—this was about seven, eight years ago I think—and I faced all kinds of things for the past seven, eight years. You know, relationship struggles, and physical pain—my father is quite ill at the moment—there’ve been all kinds of challenges. And challenges in becoming a teacher—because that was unexpected—and being asked to go out there and talk to people and being asked all kinds of challenging questions, and opening myself up to all of that and not becoming (or resisting the urge to become) some kind of enlightened guru who’s going to save the world. You know, really always checking myself that I wasn’t becoming too attached of this idea of myself as a teacher and as some kind of savior who had all the answers. So I’ve faced all kinds of challenges over the past few years, but in each and every case, it’s really been a case of staying with what was arising and staying with the sadness and staying with the pain, staying with the confusion and doubt, and knowing that really this is all an invitation. It’s all just an invitation to remember. I think that experience with the chair, that remembering of something so familiar, that really is still just basically there not matter what I’m going through, no matter what experiences I’m having. No matter how intense the waves of life become, there’s this deeper knowing that these waves are allowed to be here. It’s like an honoring of life. It’s an honoring of the life that is moving in me. I think that it seems to me, that that’s what we forget as human beings. You look in the world, and there seems to be so much conflict and fear and stress. It seems to me that all human conflict and violence and suffering stems from this basic, basic, basic, forgetting of who we are. We stop honoring life. When we stop honoring life, we suffer. When we stop seeing the sacredness in each and every moment, and each and every thought, sensation, feeling—that’s the birth of suffering. But then, even our suffering is part of the invitation to remember. We don’t want to make suffering into this new enemy that we have to destroy. Suffering is an invitation. If we can see it that way, you know? When you’re suffering, it certainly doesn’t feel like an invitation sometimes. That’s probably true. You know, years ago when I was so depressed and couldn’t get out of bed some days because life was so heavy, it certainly didn’t feel like an invitation. Looking back, I realize now that it was. I guess back then, I just couldn’t see it. I saw the moment as something to be fought and escaped, rather than seeing the moment as something to be embraced and met and stayed with. So I think that’s our adventure and our challenge. And that’s our invitation, is to stay. Stay. Stay. Stay. I mean in every sense of the word, stay. Meet. Meet ourselves, no matter how uncomfortable it gets, or how intense the waves get, because there could be gold in those waves—you know, to mix metaphors. If we can just stay with our experience, even if the temptation is to run away, the urge is to run away—but the invitation is stay, stay with the discomfort. Stay with the confusion. Stay with the doubt, because there may be gold, there may be gold dust in that doubt. There may be gold in that fear. There may be gold in that sadness, but you’ll never know if you turn away. You’ll never know. And who wants to—you know, I don’t want to die having never known. So that’s really what I share and what I talk about in my book, and in my meetings and retreats, is this staying with life, and how do we meet life? How do we stay with life? How do we say “yes” to life? And maybe, as I suggest in my book, maybe it’s not even a question of how, maybe it’s not even a question of how to stay. Maybe it’s not even a question of how to meet life. Maybe it’s not even a question of how to allow this moment. Maybe on a deeper level, this moment is already being allowed. Maybe who we are is already allowing this. So maybe it’s not even a question of how. Maybe the “how” dissolves. Maybe in that staying with discomfort, the “how” dissolves, and we finally meet what we were never able to meet. And maybe finally we can rest, actually, in discomfort. We can rest in our pain. We can rest in our sadness. However strange and paradoxical and counter-intuitive that sounds, but maybe that’s where the true rest lies, is actually in everything that we thought we needed to run away from. Maybe that’s where the true rest is hiding, the last place you would ever look for it. You know? TS: Now I have to say, Jeff, I love listening to you. I love talking with you. And I’m just so honored and pleased that Sounds True is working with you and that we’ve published this new book of yours. You know, it’s so wonderful to meet a young, you could say emerging spiritual teacher in that you’re not well known yet, and I think that your work is so helpful. It really brings people down to the ground and to the core. So I want to thank you, and we’ll have another conversation soon. This, I think, is a good place to stop for now. How does that sound? JF: Well, thank you so much Tami. It’s a real pleasure to meet you. TS: Exactly. It does feel like a meeting. I’ve been speaking with Jeff Foster. 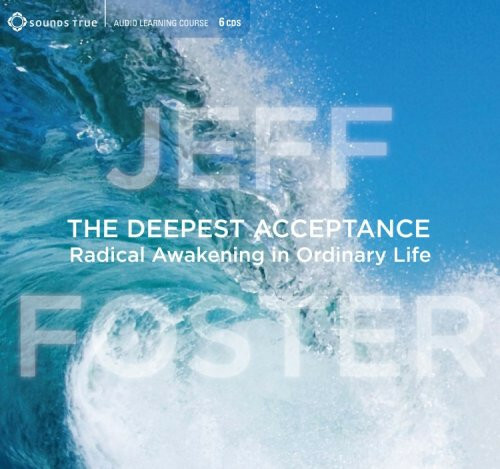 He’s the author of a new book, it’s called The Deepest Acceptance: Radical Awakening in Ordinary Life, and Jeff has also created with Sounds True a six-session audio learning series on The Deepest Acceptance. Jeff, as always, wonderful to be with you. You make it real. TS: From SoundsTrue.com. Many voices. One journey. Thanks for listening.